This PRIVILEGE 615 from 2009 is very elegant, in high gloss cherrywood, and in a modern version with the salon in L-shape, not round ; the bar area is at the main entrance, and the chart table on port side, while the galley is down, well equipped with 2 fridges and 2 freezers. 2 VIP double guests are at the rear, another one forward starboard with access to the bow peak, (used as crew quarters ). Of course the superb Master suite is in the centre forward, with full storage and bathroom, and also a dedicated office in gangway. 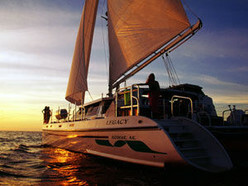 The definition is generous with a large capacity of fuel of 2000L, generator, watermaker, A/C, satellite and quite updated with a carbon canoe boom ; 2 helmstations with bimini on mid sized level, large cockpit in teak, and 2 spacious transoms are guaranteeing full enjoyment.? 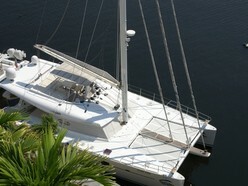 His second owner has always employed a captain for offering you the best quality and maintainance on a Privilege !